Justin and I celebrated our honeymoon (more than 10 years ago!) in Morocco. We traveled across the Mediterranean sea by ferry from Sète in the South of France. The journey took two nights, and we slept in a little cabin on board. It was a simple ship, but I'll never forget sitting outside on the deck, socking in the sunshine, when a pod of dolphins appeared in the water right beside us. I love the interesting combinations of spice and fruit you find in North African cusine, and once we arrived in Morocco we were excited to taste as much authentic local cooking as possible. 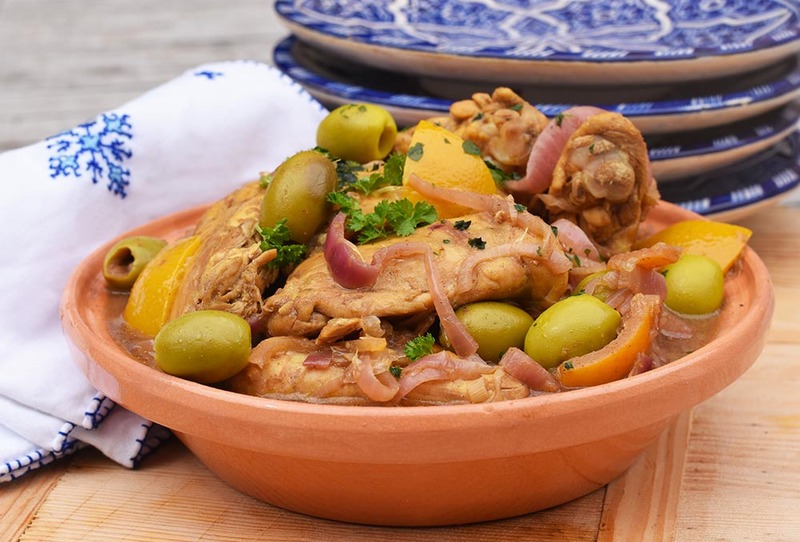 Of everything we tried, our favorite dish was a traditional chicken tagine with preserved lemons and olives. It's such a unique and distinct flavor combination; it's bold and delicious. I've made many renditions of this dish over the years, trying to recreate the experience we had on our honeymoon, and I this recipe really captures what we tasted on that trip. I bought the hand-embroidered napkins and hand-painted ceramics in Morocco on our honeymoon, and they're still going strong! Heat the oil in a pan over medium heat, and saute the chicken until brown on all sides. Transfer the chicken to a dutch oven. Now saute the garlic and onions in the same pan, until soft. Transfer the onions to the dutch oven with the chicken. Remove the pulp from one of the preserved lemons and finely slice the peel. Sprinkle this over the mixture in the dutch oven. 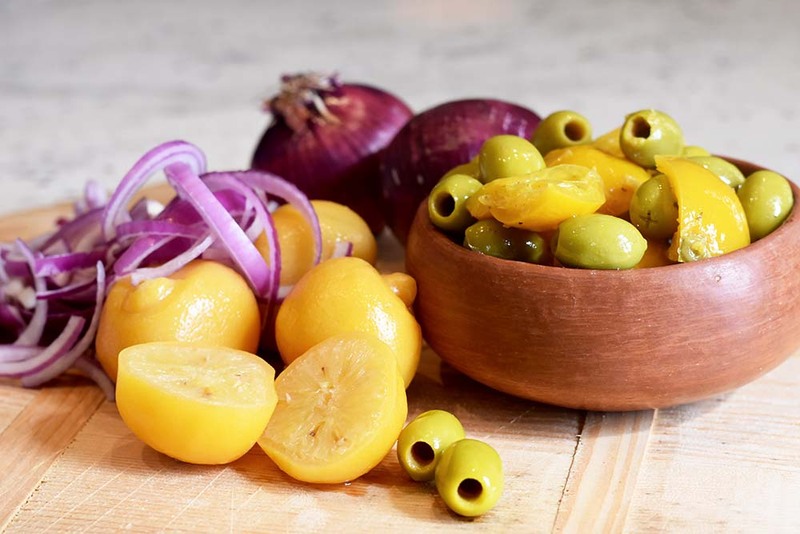 Cut the other preserved lemon in half and remove the seeds, then roughly chop the lemon into juicy chunks. Set aside for later. Mix the saffron with the chicken stock and lemon juice, and pour over the chicken mixture in the dutch oven. Then add the olives, cinnamon, ginger, and cumin. Stir the mixture thoroughly so the spices are evenly distributed throughout the liquid, and the chicken is also evenly coated. Replace the lid on the dutch oven and set to simmer for 30-40 minutes on medium-low heat. Once the chicken has cooked through and the flavors have married, stir through the remaining chunks of preserved lemon and sprinkle with fresh parsley. P.S. You might also like this Moroccan Lamb Tagine (it's another favorite), and 10 things I've learned after 10 years of marriage.